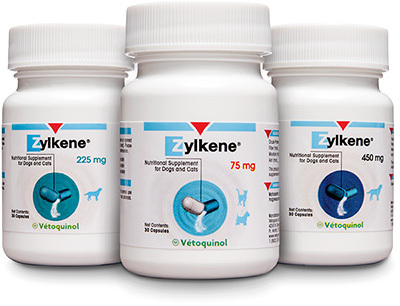 Zylkene can help improve quality of life for pets—and their owners! Situational stress and environmentally-induced problems are common in dogs and cats, and affects them in a variety of ways. Zylkene helps balance reactions in some situations (travel, moving, adoption, grooming, meeting new people, loud noises, etc.) and helps animals maintain normal and relaxed dispositions. Zylkene may also open pets’ receptivity to behavior-modification training. Zylkene capsules can be administered orally, or opened and mixed with a meal. Use as recommended by your veterinarian. Short-term use: Use Zylkene for 1–2 days before a planned event or change in environment. Some animals may need earlier administration (5–7 days).